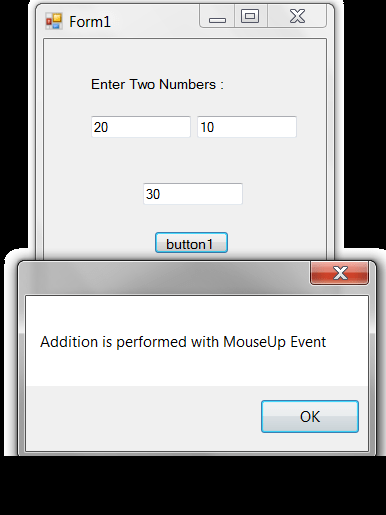 This is a C# Program to perform addition with mouseup event. This C# Program Performs Addition with MOUSEUP Event. Here when the mouse is moved up over the button message box is displayed in windows forms application. Here is source code of the C# Program to Perform Addition with MOUSEUP Event. The C# program is successfully compiled and executed with Microsoft Visual Studio. The program output is also shown below. This C# program is used to perform addition with MOUSEUP event. We are creating two text boxes for reading two integer values to perform addition. Then third text box is used to display the computation of sum of textbox1 and textbox2 values. When the mouse is moved up over the button message box is displayed in windows forms application.